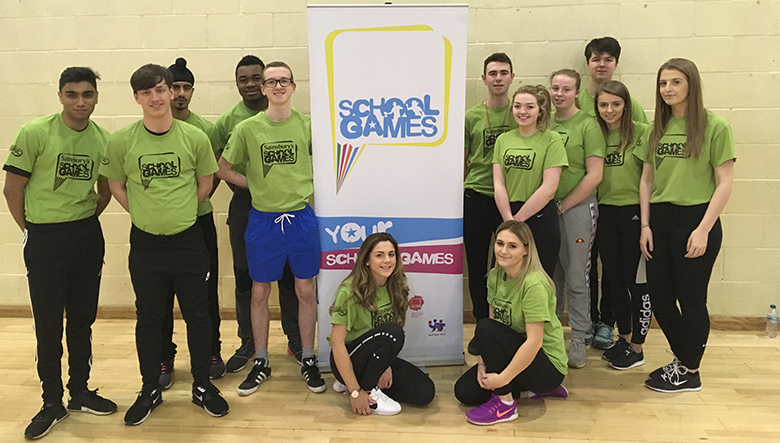 Sports students at The Sixth Form College, Solihull have been working with primary school children at athletics and dodgeball championships in recent weeks to develop their Sports leadership skills. The heats of the Solihull Primary Schools Sports Hall Athletics competition took place at the College at the end of January and start of February. 20 primary schools attended with over 600 youngsters taking part in the competition. First year BTEC Sport students worked in conjunction with Sports Development Officers from the South Solihull School Sport Partnership to officiate the range of events. On top of their BTEC studies the students had previously completed a Sports Hall athletics officiating qualification in preparation. The event also allowed the Year 12 students to complete important voluntary work, which counts towards their Sports Leaders Level 2 Certificate and also their Careers Passport activities. The group will be officiating the County Finals for Primary and Secondary schools in March and will look to develop their leadership skills further. Meanwhile, following the successful hosting of the Solihull Primary Schools Dodgeball heats in November 2016, the BTEC students travelled to North Solihull Leisure Centre to officiate the proceedings of the Coventry, Solihull & Warwickshire County Dodgeball Finals too. “The students’ previous officiating training and experience was required during the Dodgeball event, as decision making at speed whilst under pressure was the order of the day due to the heightened tension and emotions of both primary school staff and competitors during the event. The students were exemplary during the multi-sport event and gained many positive comments from both organising staff and primary school teachers.